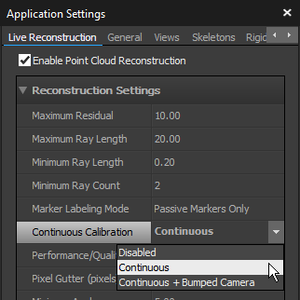 This page provides detailed information on the continuous calibration feature, which can be enabled under the Reconstruction tab from the Application Settings. The new Continuous Calibration feature ensures your system always remains optimally calibrated, requiring no user intervention to maintain the tracking quality. It uses highly sophisticated algorithms to evaluate the quality of the calibration and the triangulated marker positions. Whenever the tracking accuracy degrades, Motive will automatically detect and update the calibration and provide the most globally optimized tracking system. Ease of use. This feature provides much easier user experience because the capture volume will not have to be re-calibrated as often, which will save a lot of time. You can simply enable this feature and have Motive maintain the calibration quality. Optimal tracking quality. Always maintains the best tracking solution for live camera systems. This ensures that your captured sessions retain the highest quality calibration. f the system receives inadequate information from the environment, the calibration with not update and your system never degrades based on sporadic or spurious data. A moderate increase in the number of real optical tracking markers in the volume and an increase in camera overlap improves the likelihood of a higher quality update. Works with all camera types. Continuous calibration works with all OptiTrack camera models, including the V120 Tracking bars, the Flex series camera systems, and the Prime series camera systems as well as the Slim13E camera systems for active marker tracking. Live Mode Only. Continuous calibration only works in Live mode. It will not be active during Recording or while in Edit mode. Markers Must Be Tracked. Continuous calibration looks at tracked reconstructions to assess and update the calibration. Therefore, at least some number of markers must be tracked within the volume. Majority of Cameras Must See Markers. A majority of cameras in a volume needs to receive some tracking data within a portion of their field of view in order to initiate the calibration process. Because of this, traditional perimeter camera systems typically work the best. Each camera should additionally see at least 4 markers for optimal calibration. Camera Count Under 50. Continuous calibration is limited to systems of between 2 ~ 50 cameras. Larger systems may experience delays related to the time it takes for the calibration to update, which may affect the tracking. There are three different modes of continuous calibration: Continuous, Continuous + Bumped, and Continuous Overhead Grid. The Continuous mode is used to maintain the calibration quality, and this should be utilized in most cases. In this mode, Motive monitors how well the tracked rays converge onto tracked markers, and it updates the calibration so corresponding tracked rays converge more precisely. This mode is capable of correcting minor degradations that result from ambient influences, such as the thermal expansions on the camera mounting structure. This mode requires markers to be seen by all of the cameras in the system in order for the calibration to be updated. Whenever possible, continuous calibration seeks to maintain and improve convergence of the tracked rays throughout the volume. The Continuous + Bumped mode combines the continuous calibration refinement described above with the ability to resolve and repair cameras that have been bumped and are no longer contributing to 3D reconstruction. By utilizing this feature, the bumped camera will automatically resolve and be reintroduced into the calibration without requiring the user to perform a manual calibration. For just maintaining overall calibration quality, the Continuous mode should be used instead of the Continuous + Bumped mode. 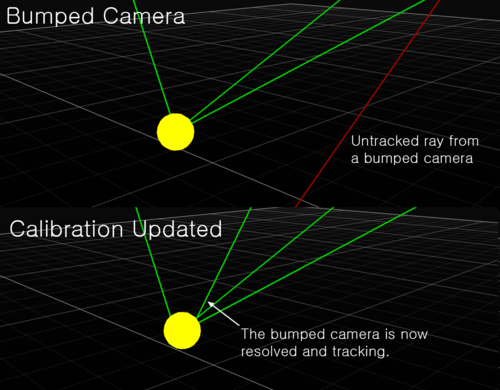 Continuous + Bumped Camera feature resolves untracked rays from a bumped camera. The continuous calibration can be enabled or disabled in the Application Settings pane under the reconstruction tab. Set the Continuous Calibration setting to Continuous, or Continuous + Bumped to allow the feature to update the system calibration. The status of continuous calibration can be monitored on the Status Log panel. Status logs after calibration have been updated. Under the Application Settings -> Reconstruction tab, set the continuous calibration to Continuous or Continuous Overhead Grid. Once enabled, Motive continuously monitors the residual values in captured marker reconstructions. When the residual value increases, Motive will start sampling data for continuous calibration. Make sure at least some number of markers are being tracked in the volume. When a sufficient number of samples have been collected, Motive updates the calibration. When successfully updated, the result will be notified on the Status Log pane. Duo/Trio Tracking Bars: Duo/ Trio tracking bars can utilize this feature to update the calibration of tracking bars to improve tracking quality. When a camera is bumped and its orientation have been shifted greatly, the affected camera will no longer properly contribute to the tracking. As a result, there will be a lot of untracked rays generated by this camera. 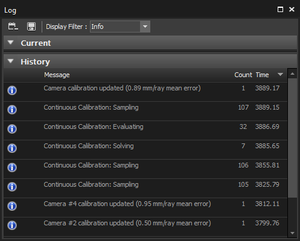 Under the Application Settings -> Reconstruction tab, set the continuous calibration to Continuous + Bumped Camera. Make sure there are one or more 3D reconstructed markers in motion within the field of view of the bumped camera. When a sufficient number of samples have been collected, Motive updates the calibration and the bumped camera will be corrected and the system calibration will be updated. 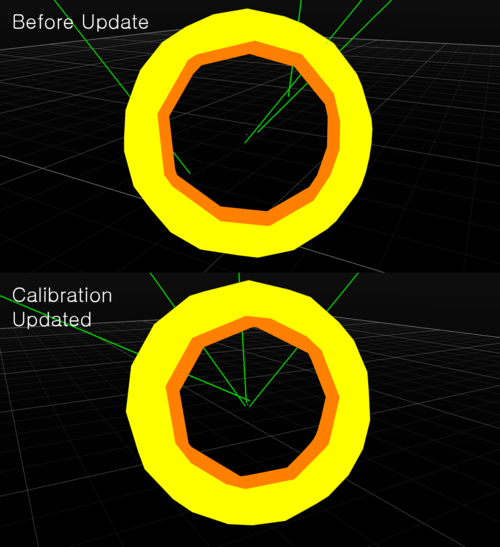 (Optional) If needed, export the updated calibration into a CAL file. Do not use continuous calibration for updating calibration with cameras that have been moved significantly or repositioned entirely. While this feature may be able to handle such cases, this is not the intended use. When a camera is moved, you will need to manually calibrate the volume again for the best tracking quality. This page was last modified on 13 November 2018, at 12:07.